What went wrong in Benghazi and who should be blamed? The Secretary of State (SOS) is the chief foreign affairs adviser to the President. The State Department employees tens of thousands of people across the globe and ultimately they report to the SOS. When appointing a Secretary of State the President looks for someone to assist in developing, implementing and executing the nations plans and objectives as it relates to rest of the world and that person represents the United States across the globe. The need for management skills should not be high on the list of prerequisites to be considered for the position. This in turn requires the SOS to have a staff reporting to her that has the necessary management skills to help achieve the goals of the department through the efforts of thousands of employees working for the State Department. Per the organization chart of the Department of State the SOS has seventeen individuals reporting directly to her. These individuals must have the ability to work without much supervision. If they cannot, they do not belong in their position. Below is a section of the above organization chart that shows who has responsibly to oversee the operations and security of our foreign embassies and offices. 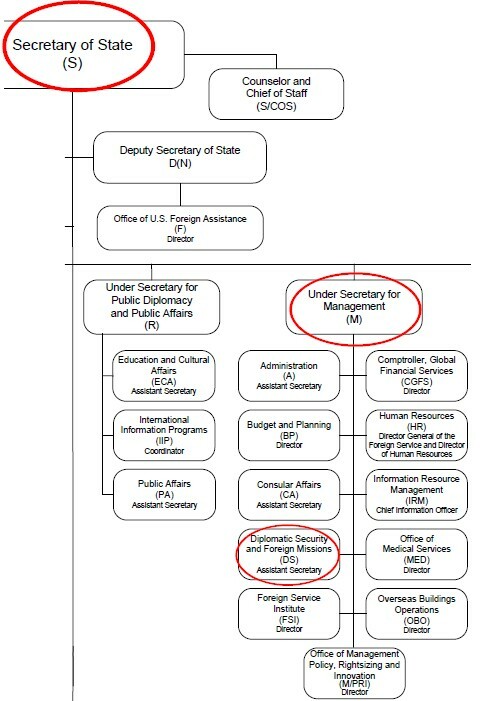 The titles circled in red are the key positions relating to embassy security. The position of Bureau of Diplomatic Security And Director, Office of Foreign Missions, Eric J, Boswell, had direct responsibility for the security of our Benghazi office, along with all of our embassies across the globe, and has been relieved of his position along with three officials reporting to Mr. Boswell. An outstanding issue that should be put to rest is whether Mr. Boswell's superior should also be relieved of his duties. This person, Patrick F. Kennedy, is the Under Secretary of Management and reports directly to the Secretary of State. Secretary of State Clinton needs to make that decision and justify it to Congress and the American people. Ms. Clinton is in the best position to make the call. Aside, Susan Rice was thrown under the bus when she went on TV talk shows claiming the attack was not caused by terrorist.